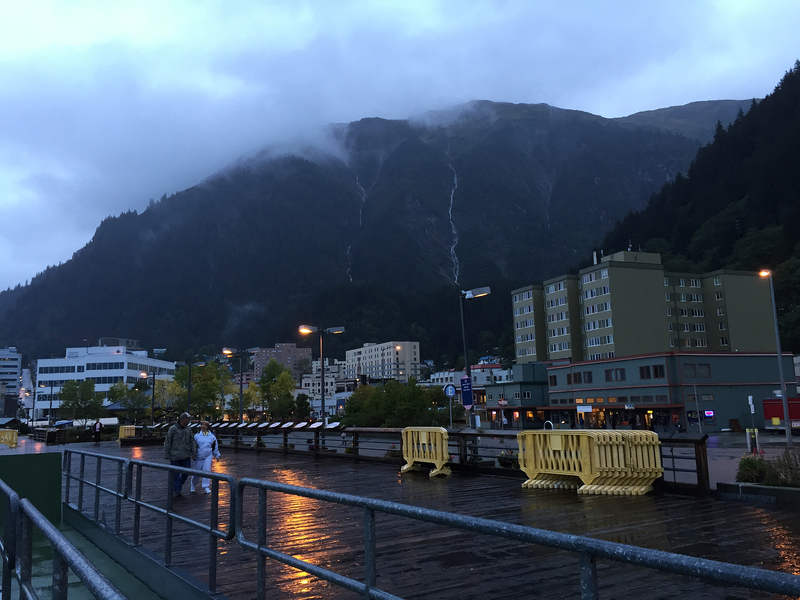 On Sunday, August 30, we embarked on the final stage of our trip by traveling southeast to Juneau, Alaska’s beautiful capital city. 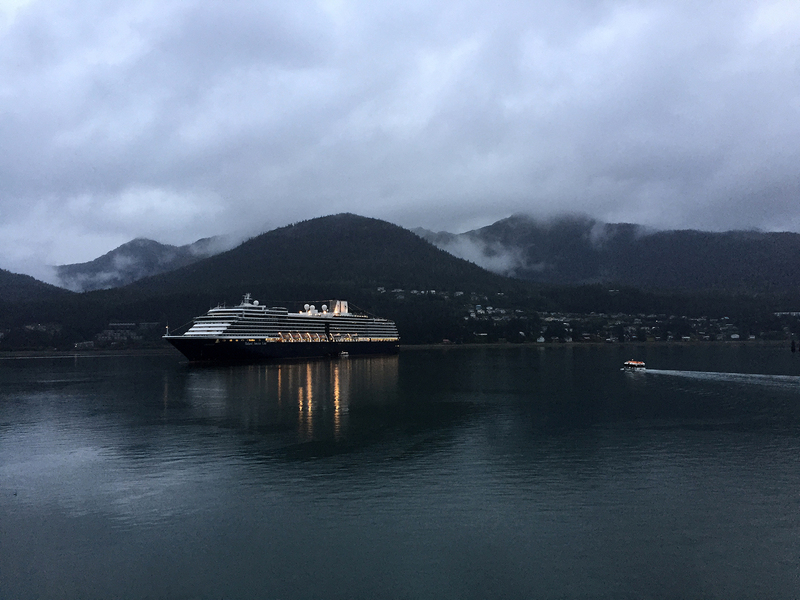 Tucked between coastal mountains and the Gastineau Passage of Alaska’s famed Inside Passage, Juneau is inaccessible save by air or sea. Its population is small, only 32,000 people. Yet it is a cosmopolitan city that feels like the ultimate extension of the Pacific Northwest vibe of Portland and Seattle (and presumably Vancouver). 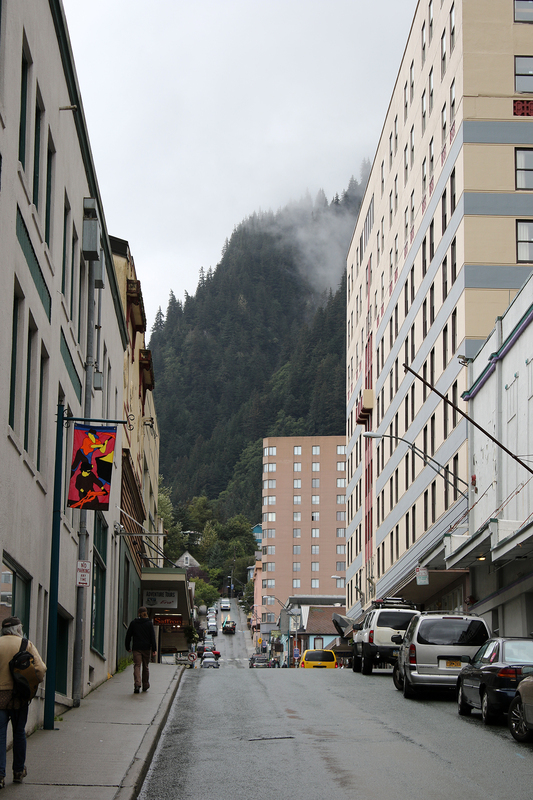 We decided that we could definitely live in Juneau. 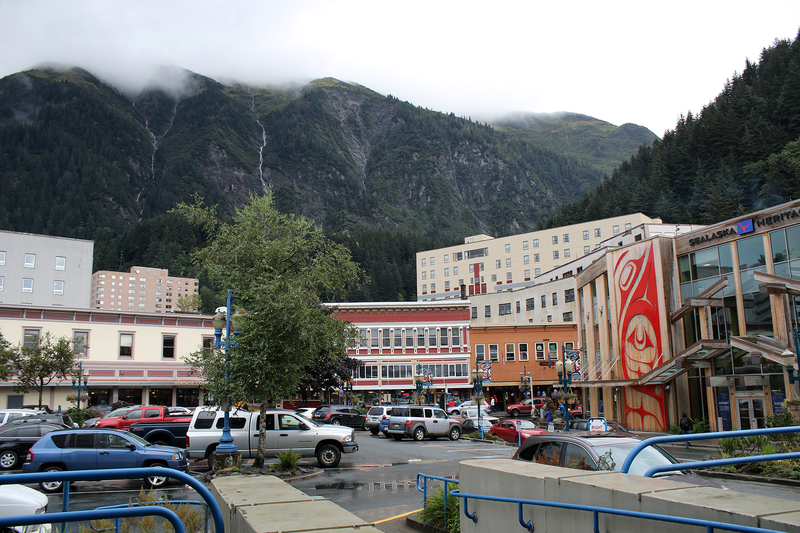 In the morning, we bid a relieved farewell to the Anchorage Downtown Hotel and headed to the Anchorage Airport. 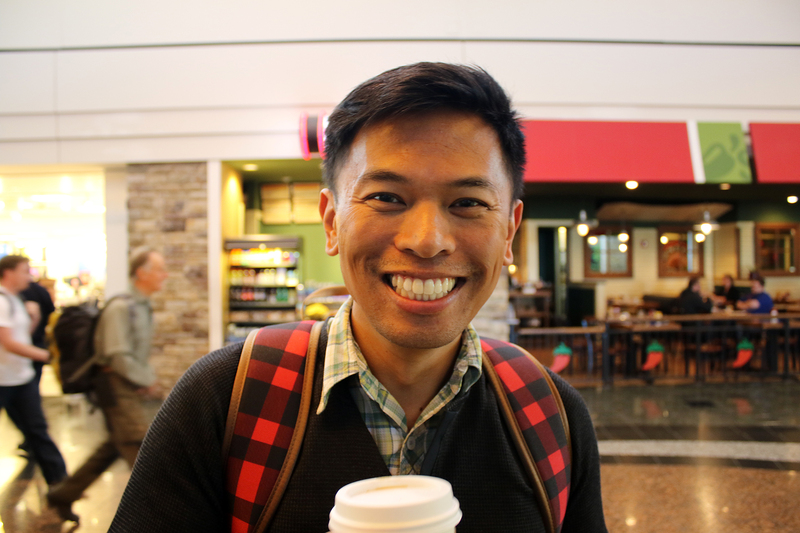 We returned the Jeep and went to the terminal to hang out before our 12:38pm flight. As we went through the line to security, Sean got stopped for an extra hand swab security check. We’d have shrugged it off as the “random” check the TSA worker claimed it to be (after all, a blonde girl had been pulled out of line by the same TSA worker immediately before Sean was) but the same worker would pull Sean out of line again a week later as we went back through Anchorage with the same “random” reasoning. Hmmm. The brown guy gets pulled out of line twice while his white, bearded husband gets a pass both times? We got some lunch and sat in the second floor waiting lounge. 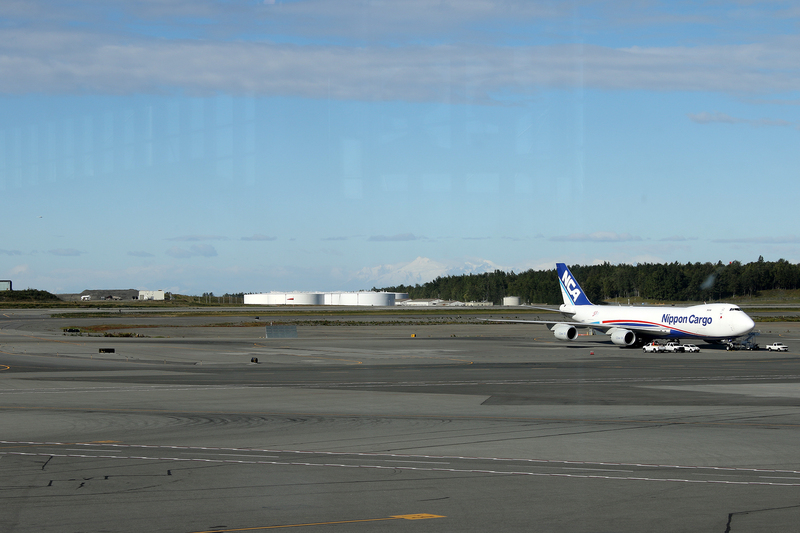 In the far distance, the Alaska Range was visible on this mostly clear day (above). 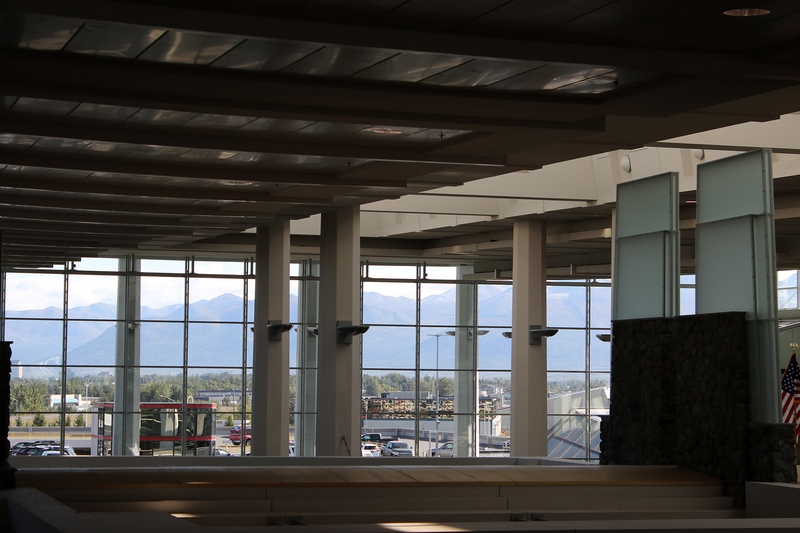 Much closer (below), the Chugach Range loomed in the windows of the terminal. 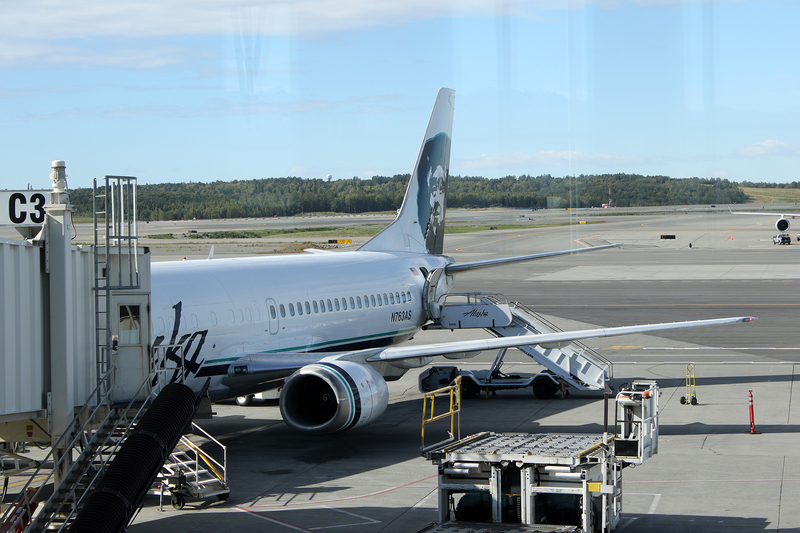 And there’s our aircraft (Alaska Airlines). It’s possible that the Alaska Range peak in the distance on the far right is Denali. We boarded our aircraft from the rear. After we were seated, Sean mentioned to the woman next to him in the aisle seat that he’d not been in an aircraft that had a wall between first class and coach. A born and bred Alaskan, she explained to us that that wasn’t the division between classes, but that the forward section of the aircraft was filled with cargo, likely mail. 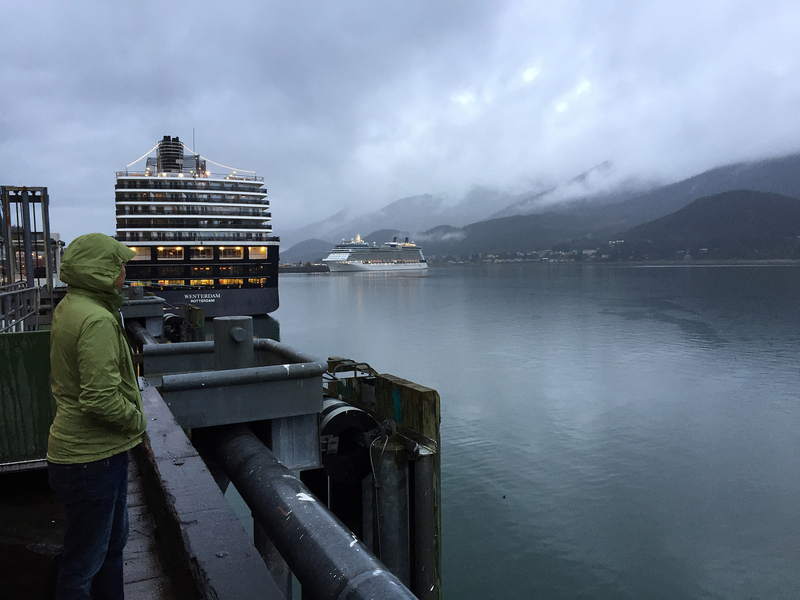 And off we went to Juneau. But first, it was a beautiful afternoon to become airborne above Anchorage and Cook Inlet. We were on the right side of the plane, so mostly we looked out at the open Gulf of Alaska as our flight hugged the coast. On the flight, I broke out my new laptop and edited two short videos from Denali (the bear and cubs and the caribou) to post on social media. I was still giddily relieved that my photos and videos had survived. 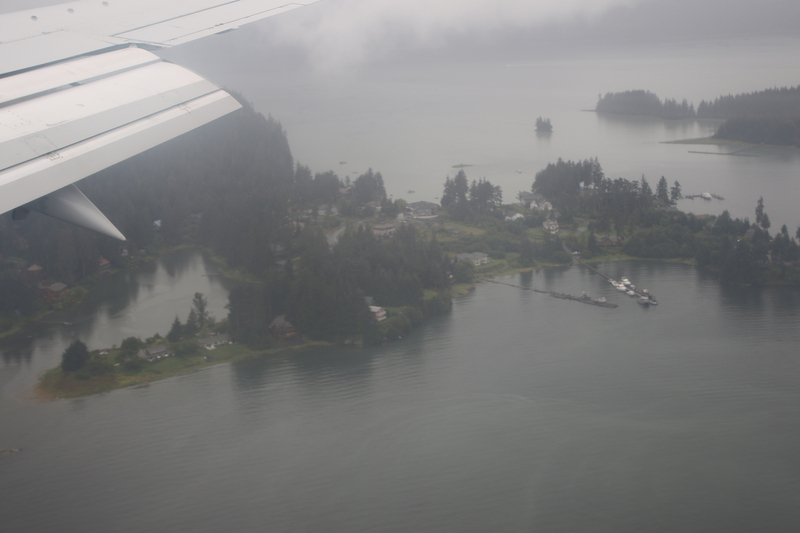 As we approached Juneau, the skies grew increasingly overcast And as we made our descent, we dropped through low, precipitation-laden clouds. 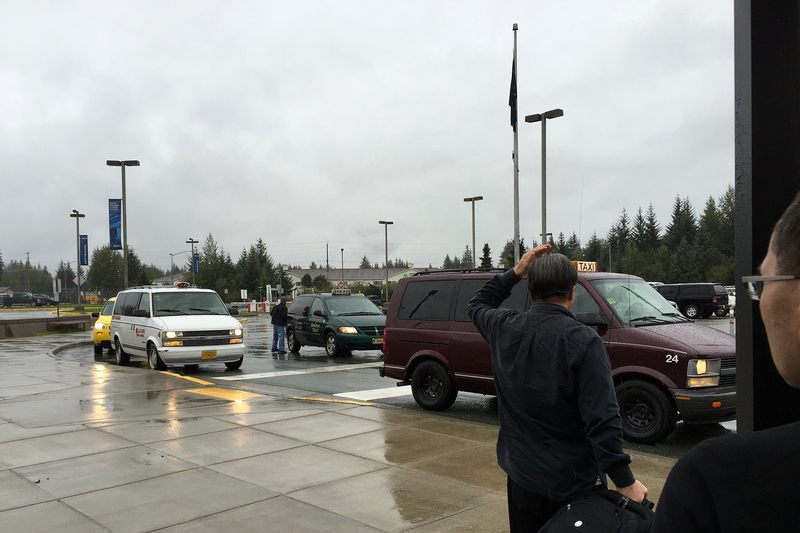 Welcome to Alaska’s sodden panhandle and the ultimate extension of the rainforests of the Pacific Northwest. While we were in the air, news broke that Secretary of the Interior Sally Jewel and President Obama had renamed Mount McKinley Denali. 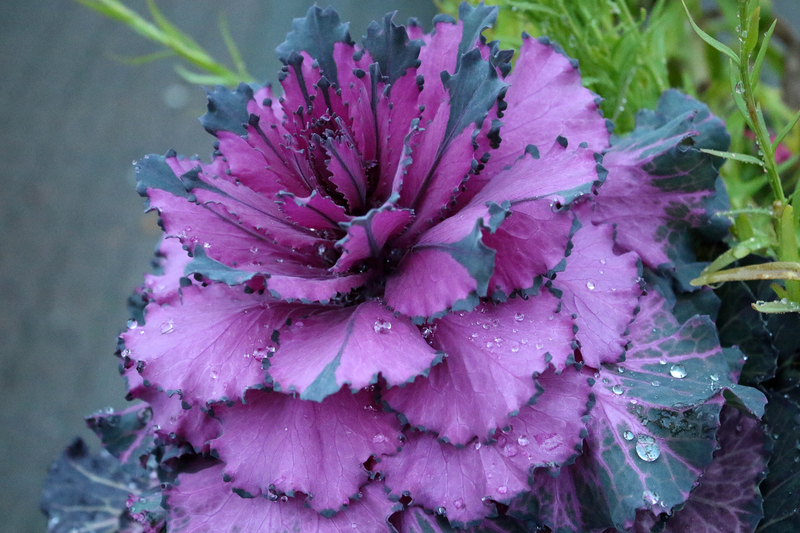 It was amazing news, and it was delightful to be in Alaska as it happened. It was something that Native Alaskans, lovers of the National Park, and the Alaska congressional delegation had been urging since the 1970s. The official panel that assesses name changes of landscape features had failed to act (neither affirming nor rejecting the proposal) for decades, which legally put it in the hands of Interior. Well done! 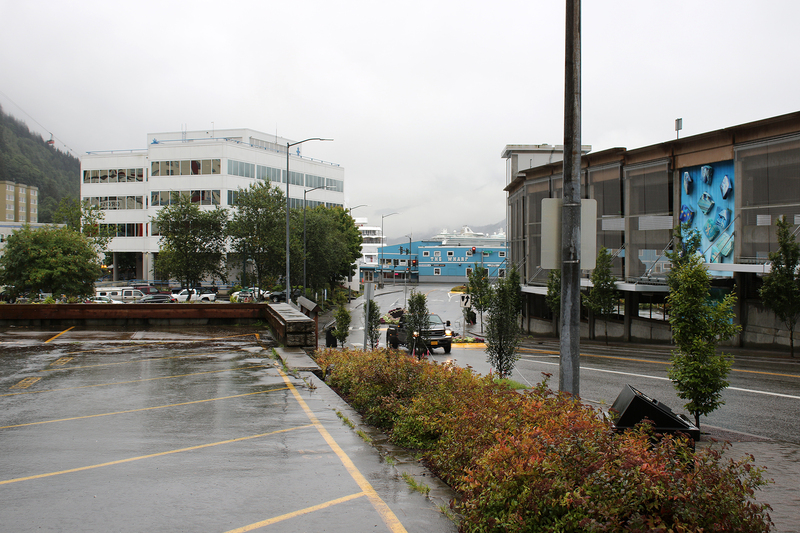 On the ground in Juneau’s small airport, we collected our packs and headed outside looking for public transportation. 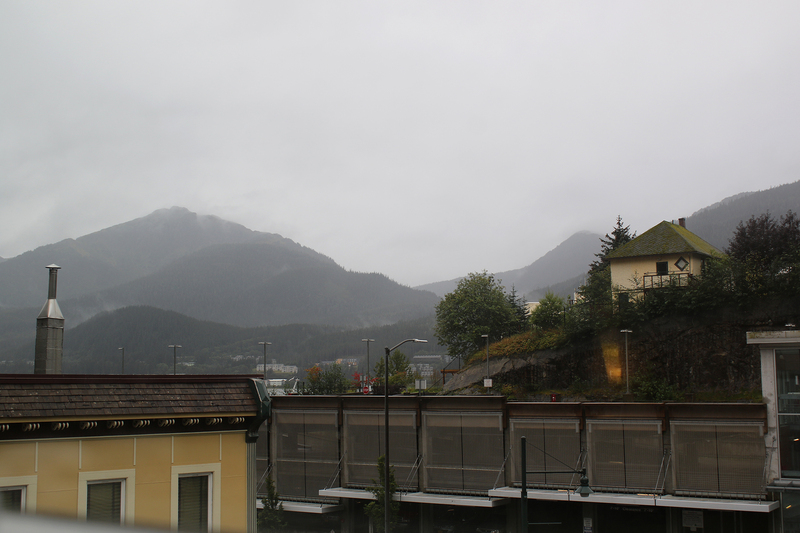 The only option to downtown was a cab, so we walked through the rain over to the taxi stand. It was all very confused with people calling numbers to request taxis and other taxis just driving up and picking up random drivers. I was dismayed that Sean seemed frustrated by the wet and the brouhaha. Ultimately, we shared a cab with another rider. 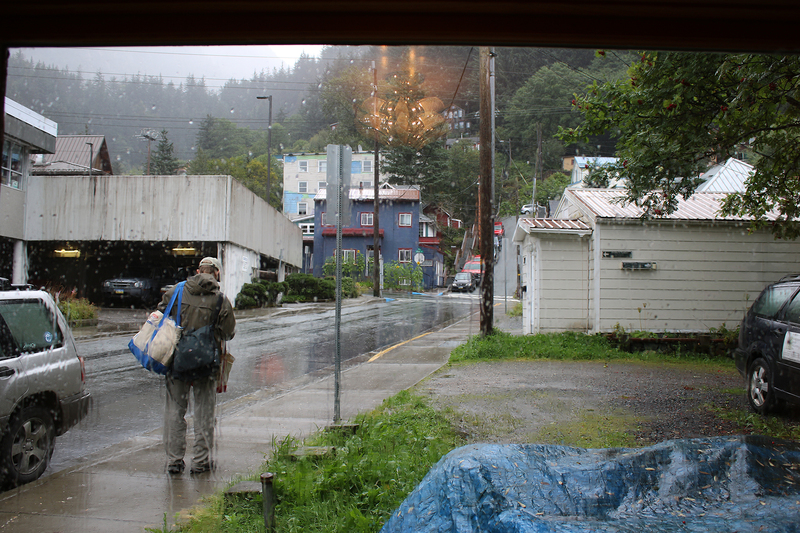 The cab let him out in the valley, the strip of land near the Mendenhall Glacier between the area north of Juneau where the airport and the ferry dock were located and the city proper. 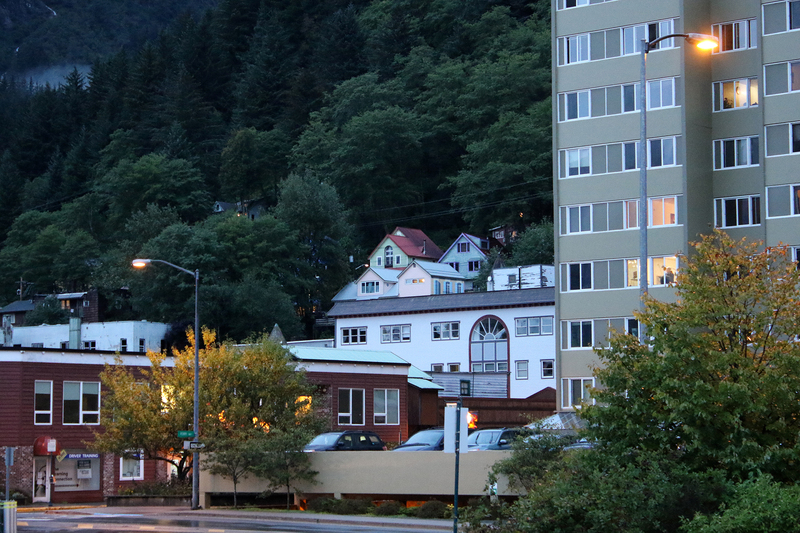 We continued on, and in about half an hour (if that) were at our hotel in downtown Juneau, the Silverbow Inn. 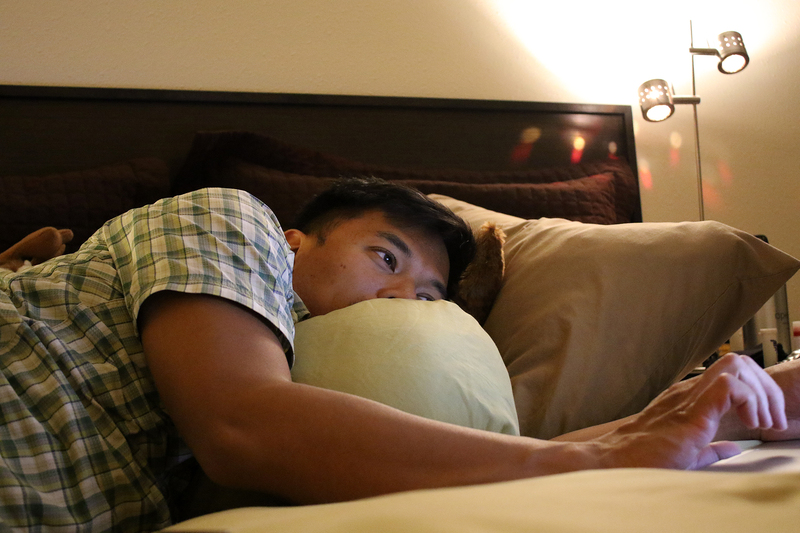 When we were researching accommodations for our honeymoon, we were more prone to give our business to gay or gay-friendly establishments than we might have been on just a normal trip. 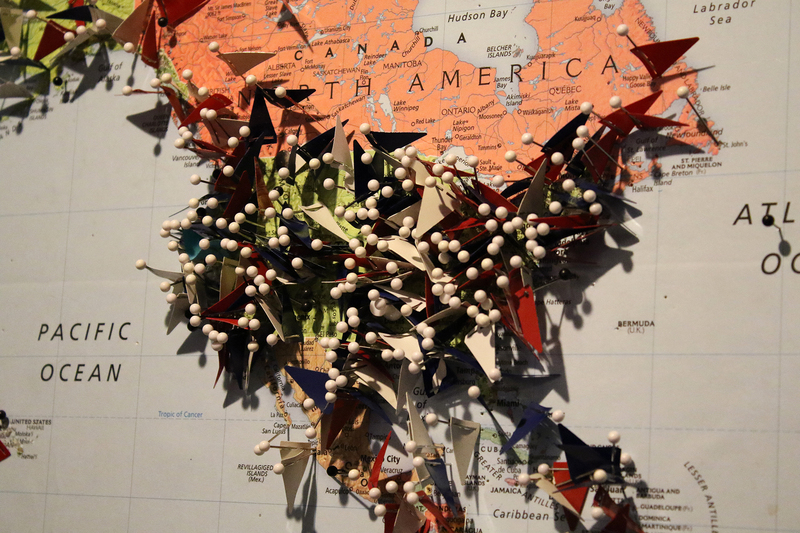 On other trips, to the Dakotas or West Texas or other American landscapes that may not be home to a population who welcomed gays, we had certainly not been closeted, but we also had not been overt. But this was our honeymoon. Not only that, it was our honeymoon in the summer following the Supreme Court ruling that affirmed the right of gay people to marry across the United States. So. 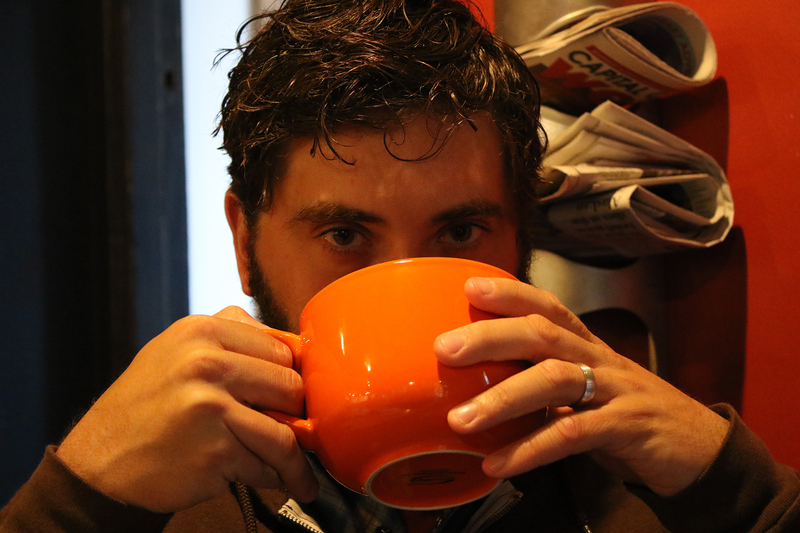 We were not ones to shy away from the moment…particularly the moment for us…on this trip. 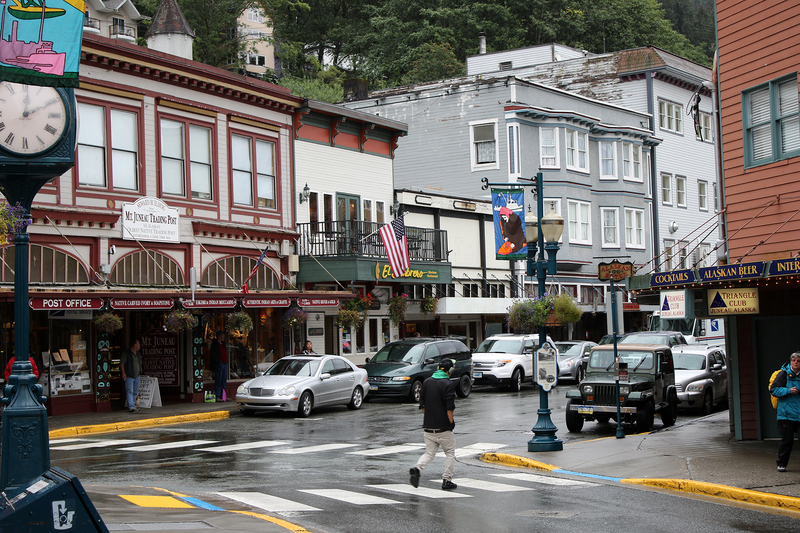 In searching for gay-owned or gay-friendly accommodations in Juneau, I came upon the Silverbow Inn. 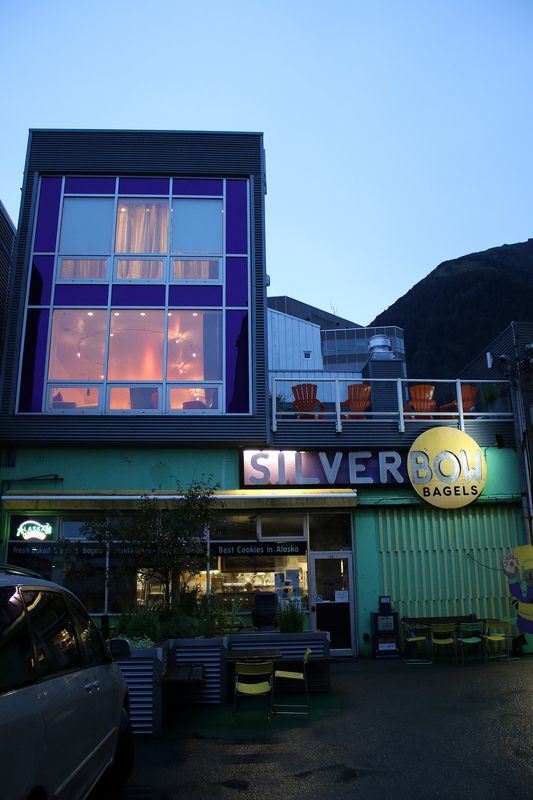 The Silverbow is a bed and breakfast…above a bakery…with a wine bar. The Silverbow was basically a hotel created for us. 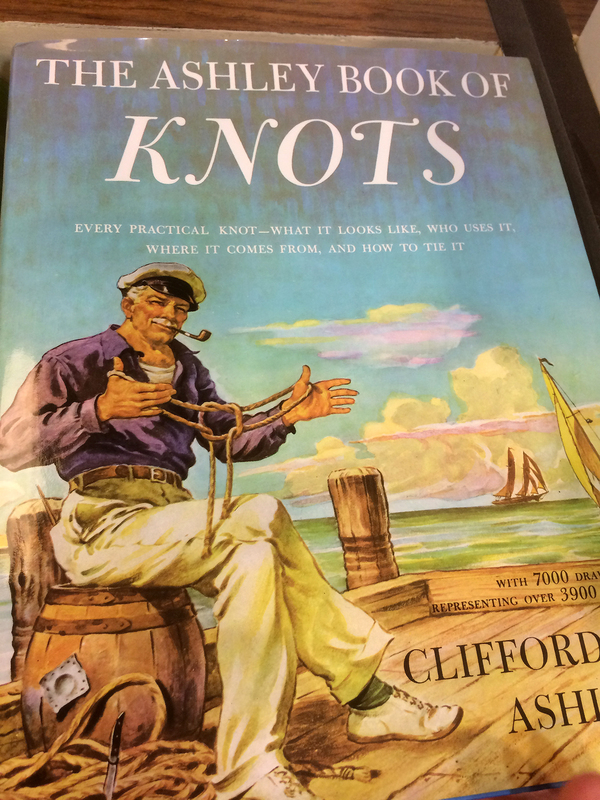 And we portrayed it as much on our honeymoon registry. The real Silverbow Inn did not disappoint, in fact it was even better than we’d thought it would be. From the moment we stepped out of our taxi on the narrow one-way street in front of the inn, through our interaction with Dave (the burly fellow at the front desk), and then on to our wonderfully cozy little room, we knew that this would be the pinnacle of our travel accommodations in Alaska. I mean, good grief. 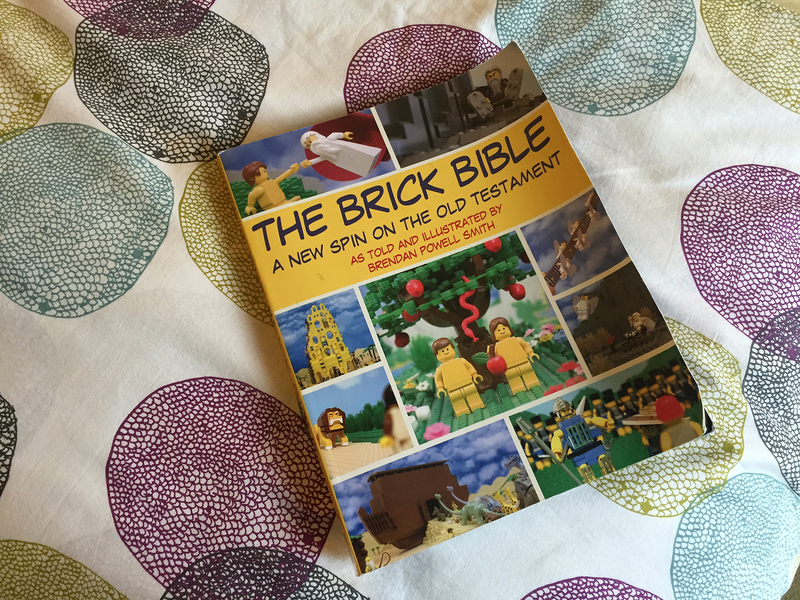 We got to our room, and the “Gideon Bible” was comprised of Lego. 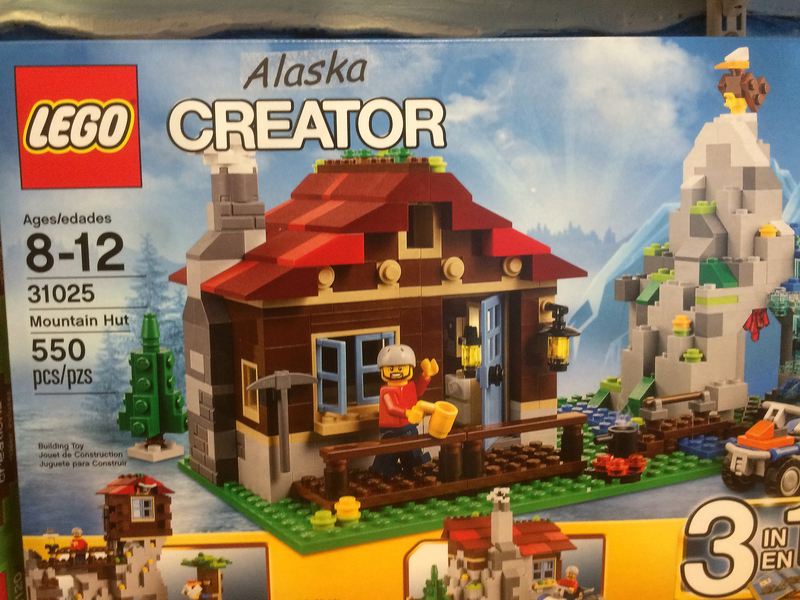 If this wasn’t the place for us, there was no place for us in Alaska. And then they sent up honeymoon champagne to our room. 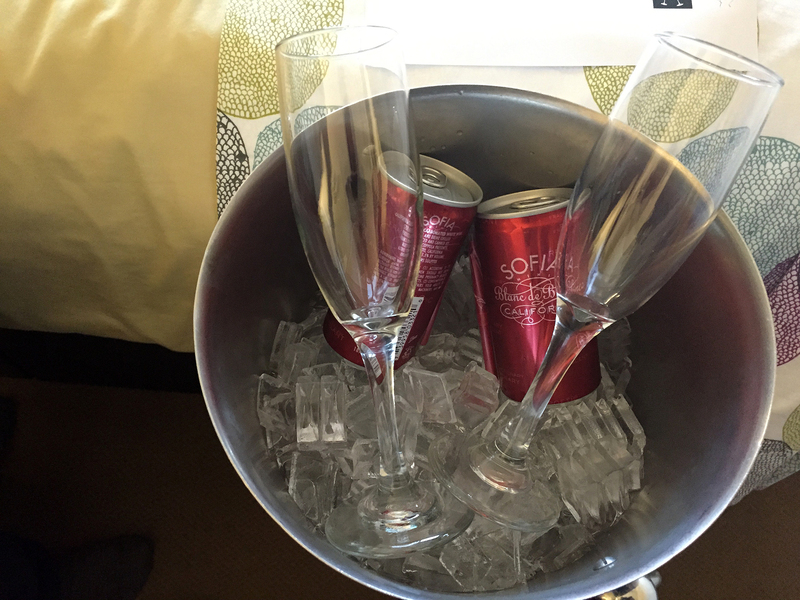 And not just honeymoon champagne, but Sofia sparkling wine (in cans) from Coppola vineyards. This was about the best thing ever. 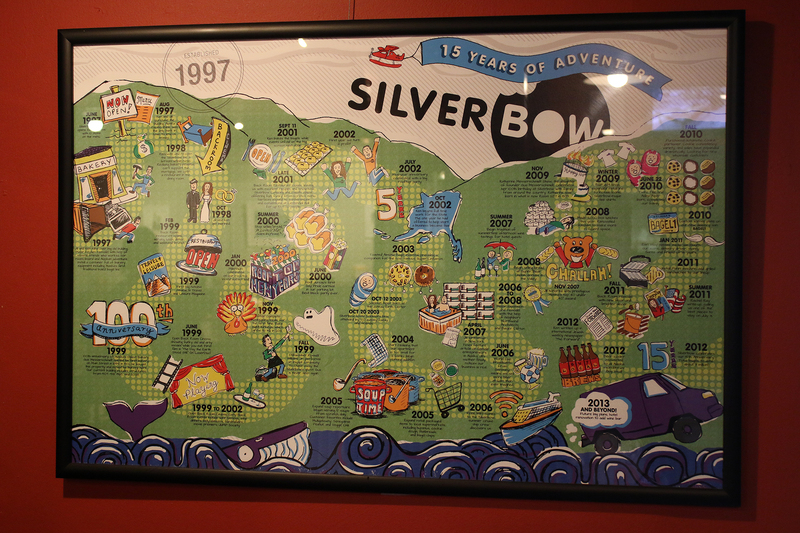 So Silverbow, so us, so right. Well played, Silverbow Inn, well played. You’ve won our hearts. 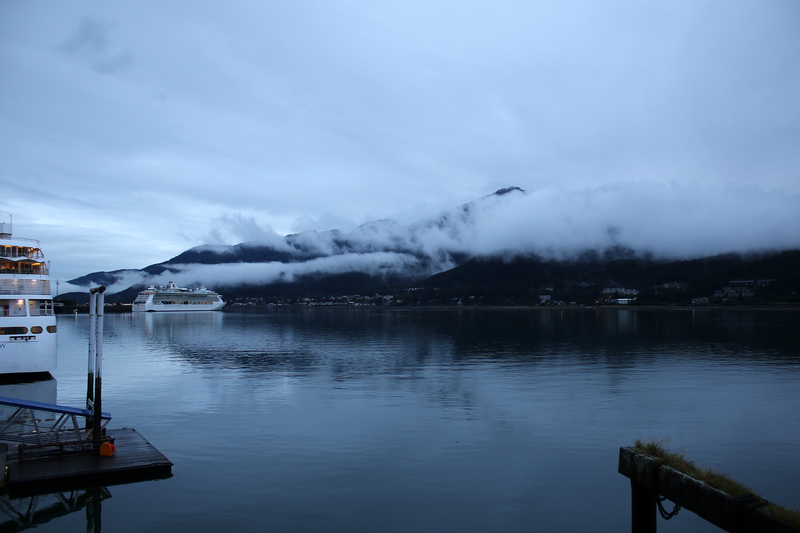 After unpacking and relaxing, we strolled out into the drizzly Juneau evening. We walked down to the waterfront and had seafood at The Hangar on the Wharf. 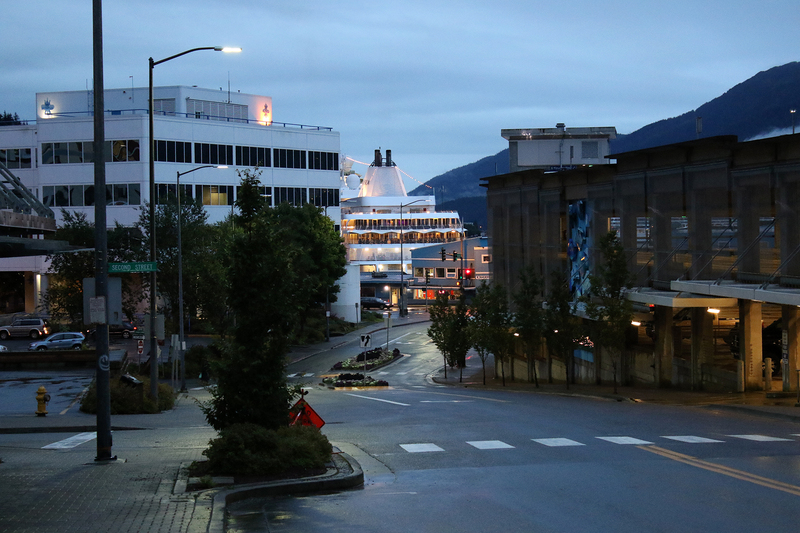 Afterward, we strolled around looking at the cruise ships docked for the night. 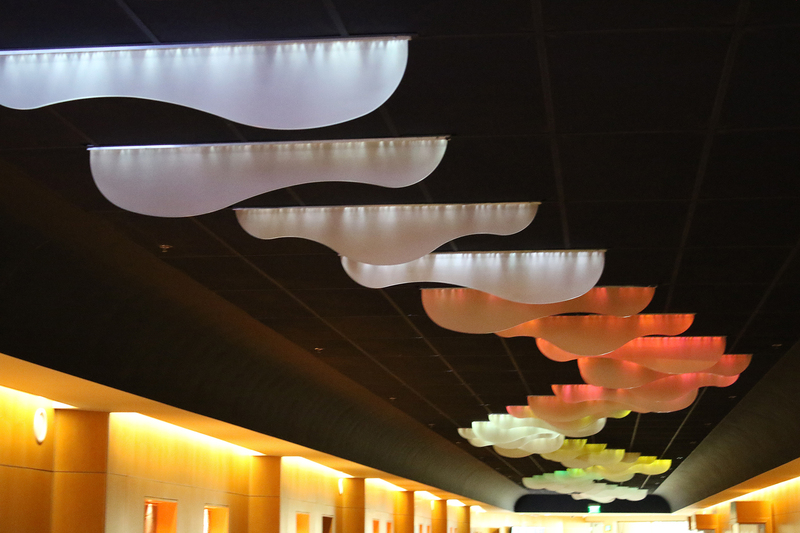 Back at the Silverbow, we had complimentary glasses of wine at the wine bar in the lobby. 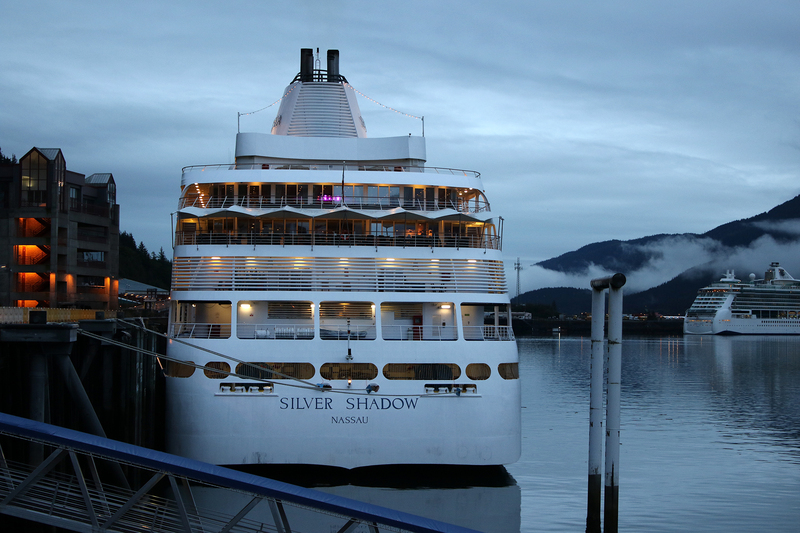 Next morning, Monday, August 31, we had our complimentary breakfast from the Silverbow Bakery before exploring Juneau. 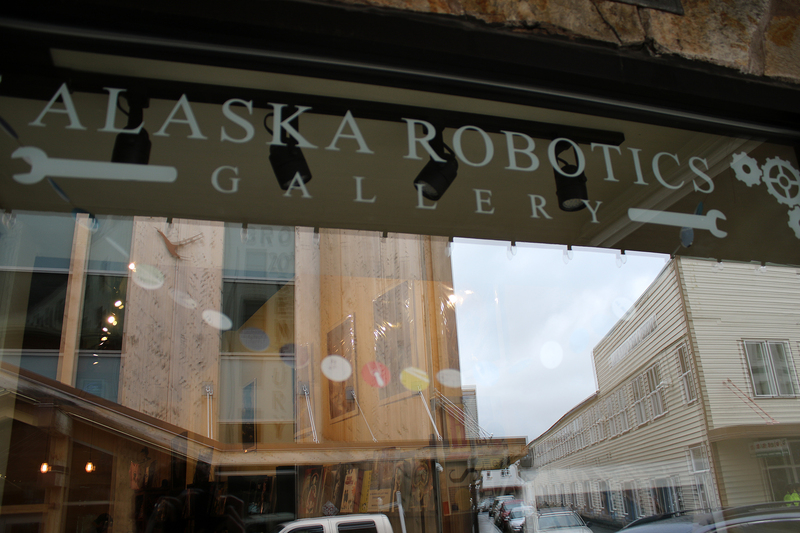 Sean fell in love with the shop, and he purchased some buttons by Alaska illustrators, a lovely children’s book about Alaska wildlife, and a hand-printed t-shirt of a smack of jellyfish. After he selected his color and size, the fellow at the counter asked if Sean wanted to join him downstairs to watch him screenprint the shirt. So of course he did. A button from Alaska Robotics that looks like a button of Sean doing finger guns in a chef outfit. So basically a button of Sean being Sean. Another favorite shop was Kindred Post, a great little, well-curated shop that also functions as the downtown post office. 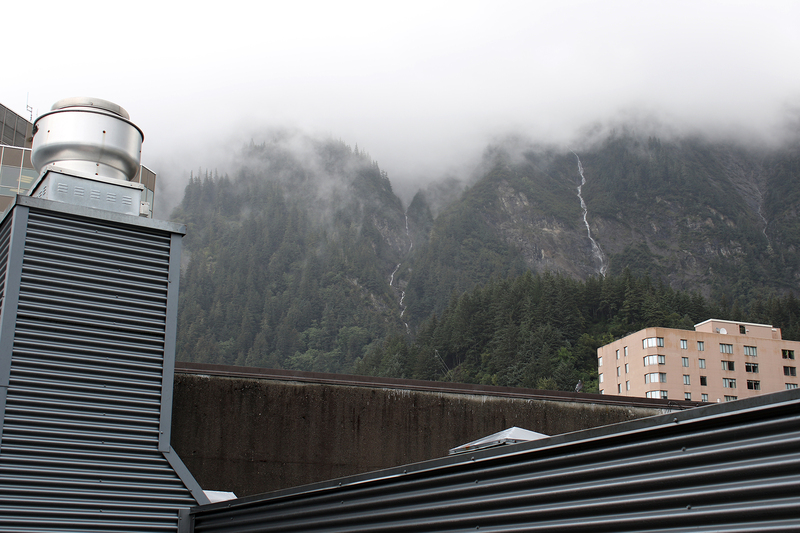 Truly, I think Juneau reaches levels of artfully hip that other parts of the Pacific Northwest merely pretend they can emulate. We totally ate it up. 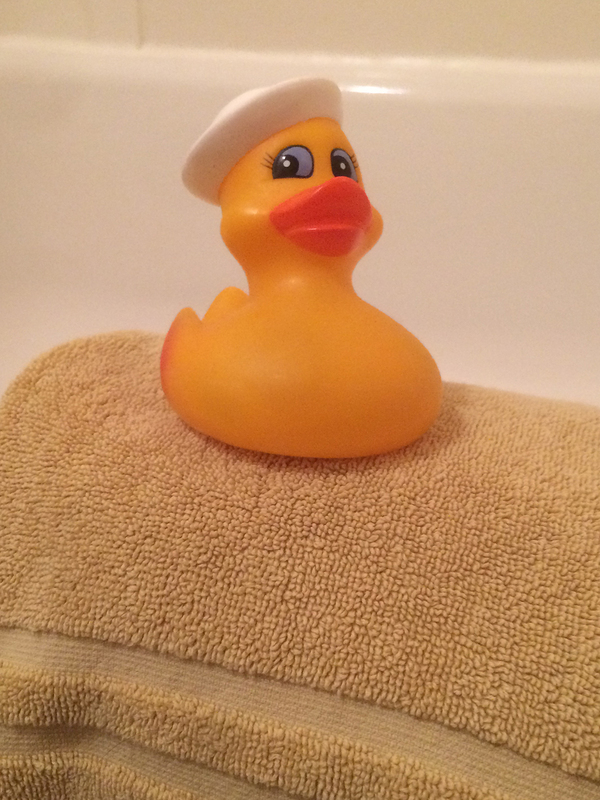 We mostly avoided the more souvenir-y places oriented to the cruise passengers. 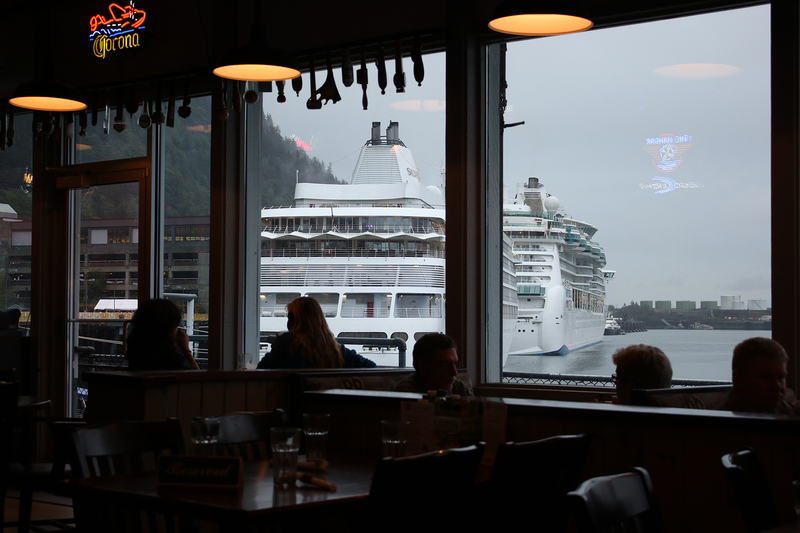 In fact, several times when we were asked if we were here on a cruise and we said no, the demeanor of the questioner changed and he or she became much more interested in us and what we were doing in Juneau and where we were staying. Often the conversation would end with our being given some sort of locals tip. 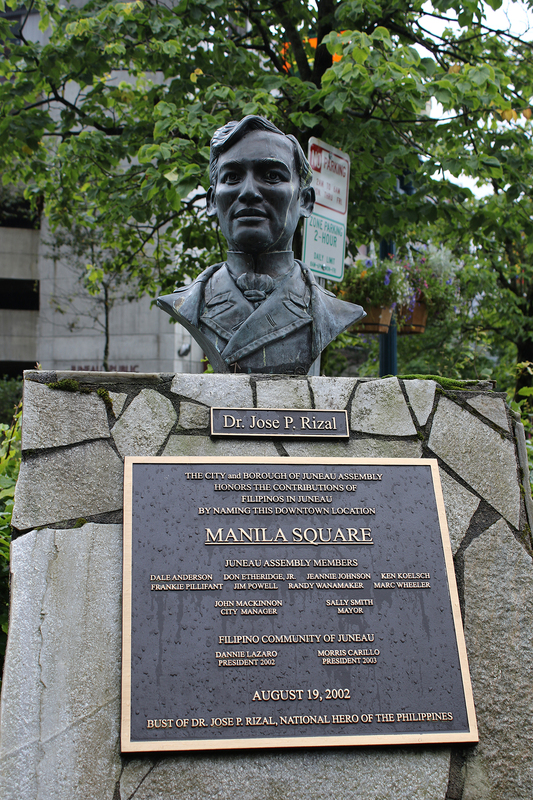 We noticed a couple of plaques celebrating Juneau’s Filipino culture, which came as something of a surprise. 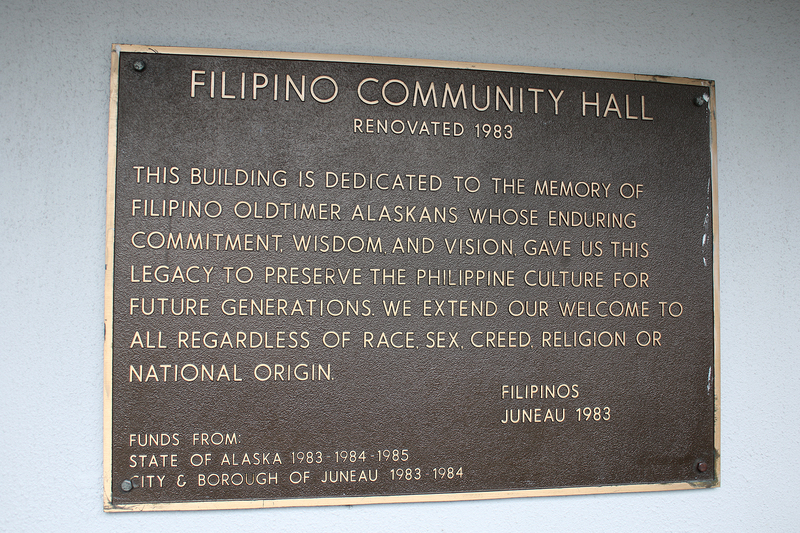 Unfortunately, the Filipino Community Hall wasn’t open for Bingo on any of the days we’d be in Juneau. 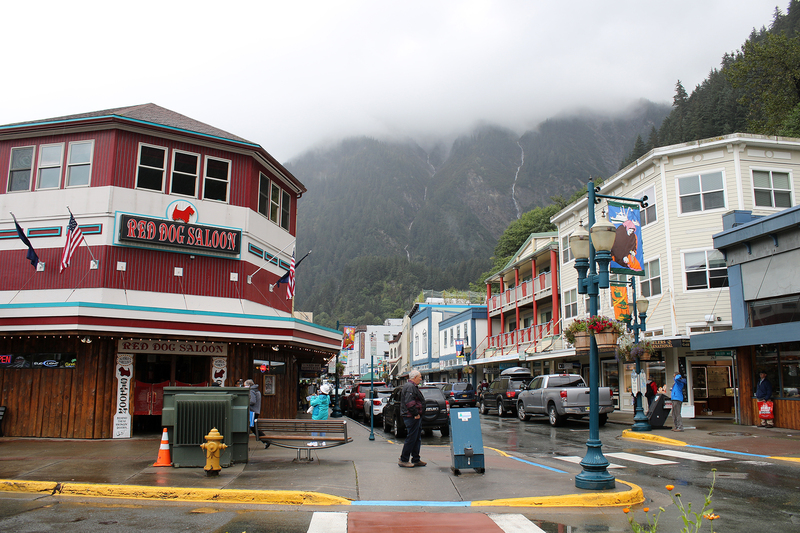 Founded in 1881, Juneau is much older than Anchorage. Hence, it has a more robust collection of historic buildings from its pioneer gold mining days. At just more than 32,000 people, it is the second most populous city in the state, although Fairbanks has a much bigger metropolitan area. Although on the mainland of North America, the steep mountains to the east and the ocean to the west cut it off the rest of the state (or continent). 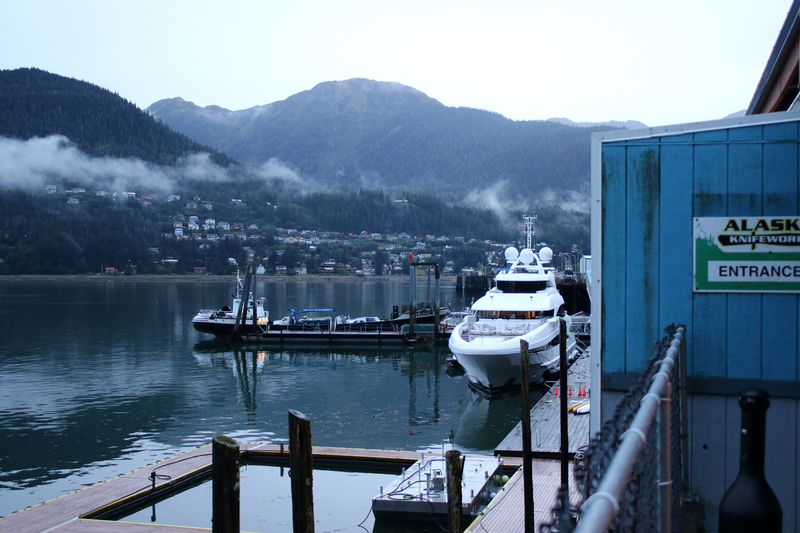 The only way to reach Juneau is by air or sea. In this, it is unique among state or territorial capitals, which it became in 1906. 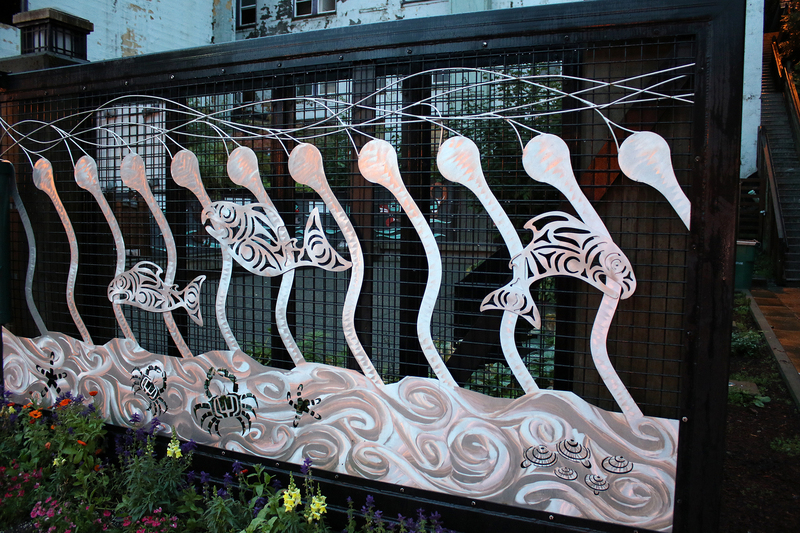 We had lunch at The Rookery Cafe, which we’d heard good things about. 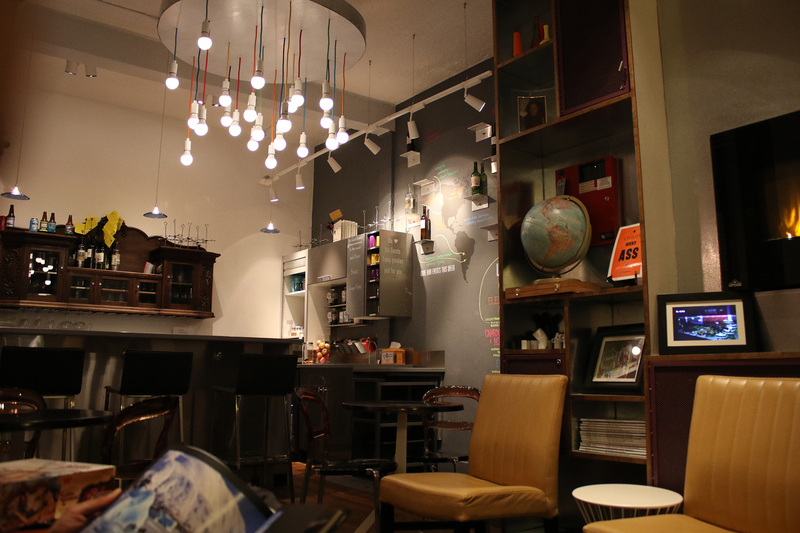 Its vibe was definitely a Foodie Culture sort of place, yet it still functioned as a coffee house and bar. We weren’t completely impressed with our lunch. It was good, but not fantastic. After lunch we walked a bit up the hill from the center of downtown to Observatory Books, a musty wonderful used book store crammed with interesting volumes. We ended up walking away with vintage National Park “black band” brochures for what was then Mt. McKinley National Park and Katmai National Monument. We also checked out Hearthside Books on our way back to the Silverbow. 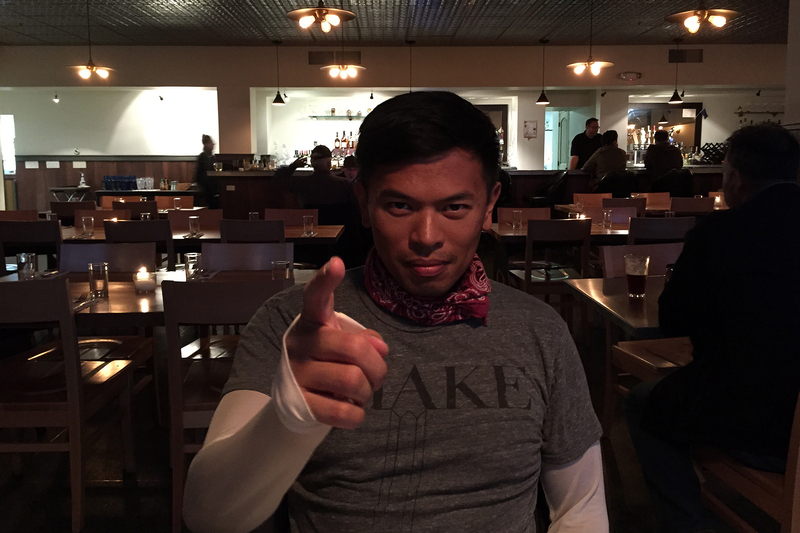 That night we had dinner at Rockwell, another gastro-pub. 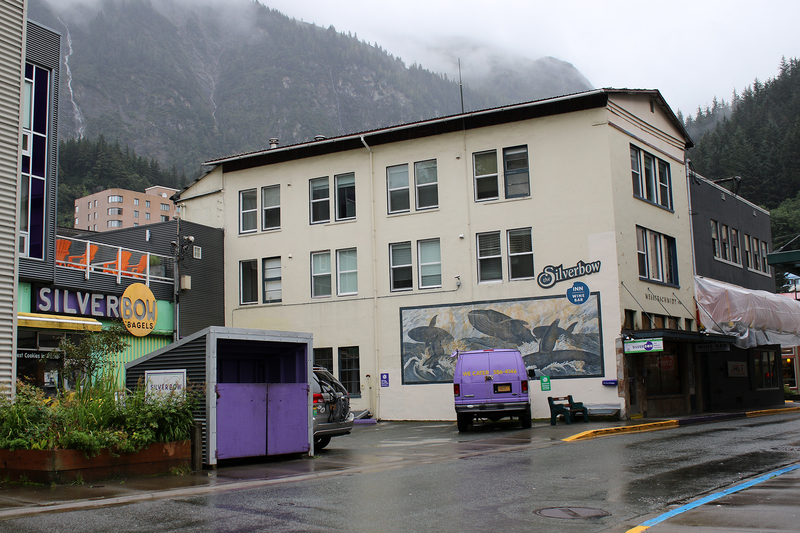 We saw that the Juneau shelter and food bank is called The Glory Hole. No comment. 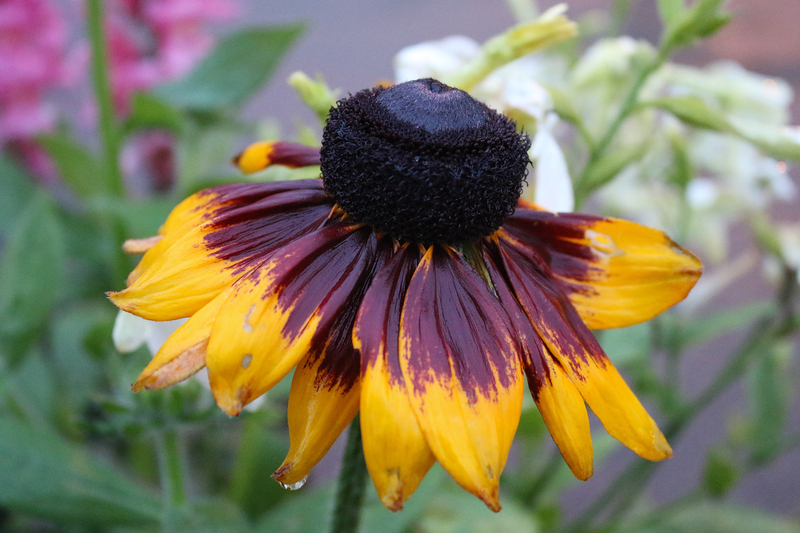 In all it was a very relaxing, drizzly day. 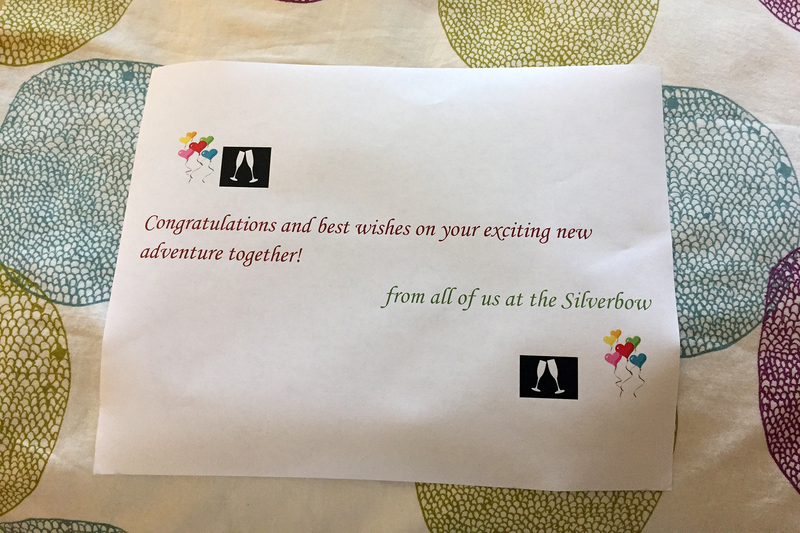 And staying at the Silverbow felt the most classic “honeymoon” of the trip. It was also about this point that social media informed us that our favorite bowling alley back in Chicago, Lincoln Square Lanes, had burnt to the ground in a devastating fire. 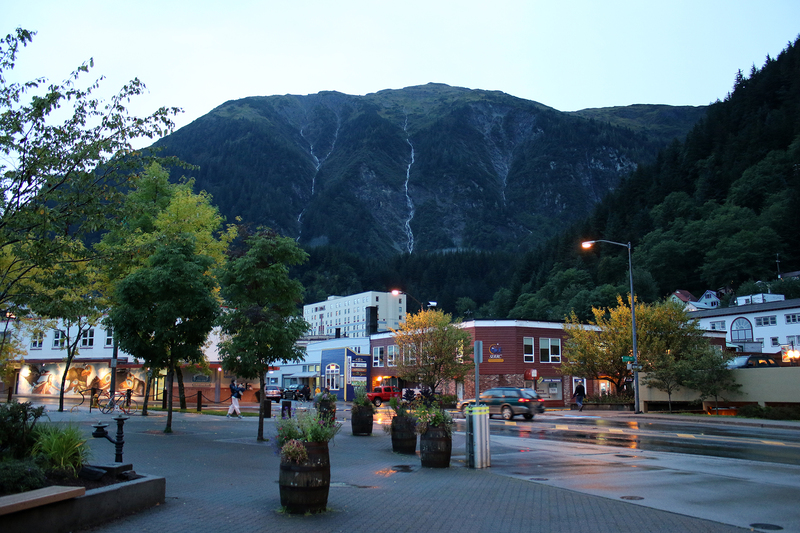 In my mind, I’ll always associate that with Juneau. We capped off the evening with a call to my parents to say hello and a dip in the Silverbow’s hot tub. 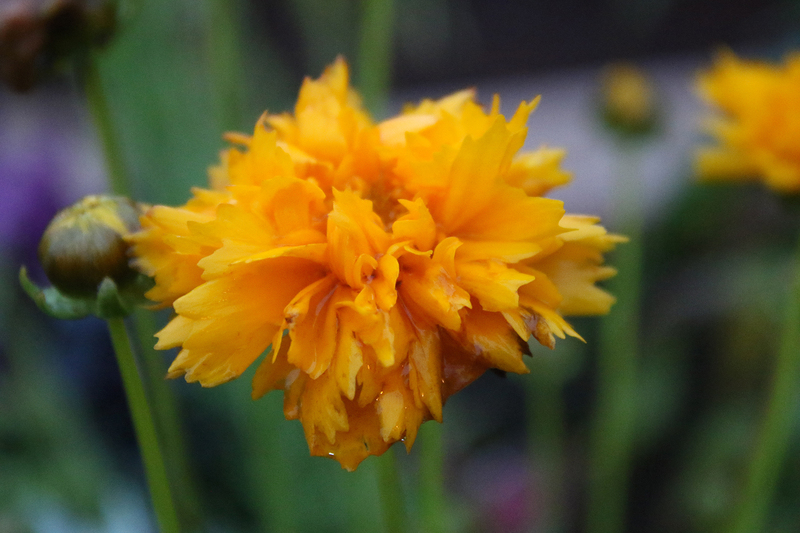 This entry was posted in Journey and tagged Alaska on March 18, 2016 by Brandon Hayes.